Unified Messaging combines the ability to access your Voice Mail, Video Mail, Voice Mail to Text Transcriptions*, Electronic Faxing and Instant Messaging from a single location or application. This improves communications and productivity by centralizing all of your communications in to a single easy to use portal that is available via the Web or your mobile device, depending on your user level. 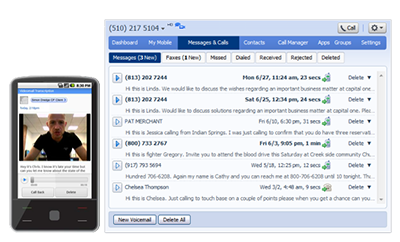 You can also easily configure your Voice Mail, Faxes, and Video Mail to be delivered directly to your email. In addition YipTel provides support for a unified voice mail box that allows you to merge your cellular voice mailbox and your YipTel voice mail box in to one. No more checking 2 message locations. Voicemail To Text Transcriptions deliver a quick and easy visual view of your incoming voice mail and video voice mail messages in text format. *Voicemail to Text is an Al a carte features with additional service fees per message.